This gorgeous mountain home offers beautiful wood furnishing and soft-colored, complementary décor. The unit has 3 bedrooms, 3 bathrooms and a deck looking out at the golf course. In the master bedroom there is a King bed with a 42" TV, while the guest bedrooms each provide Queen beds with 19" TV's. Relax in the living area in front of the 55" TV equipped with Roku and Netflix, or cuddle up by the gas fireplace and enjoy private WiFi. A fully equipped kitchen, washer and dryer, garage and Jacuzzi bathtub are available for you to use. This home has air conditioning for your comfort during the summer months. 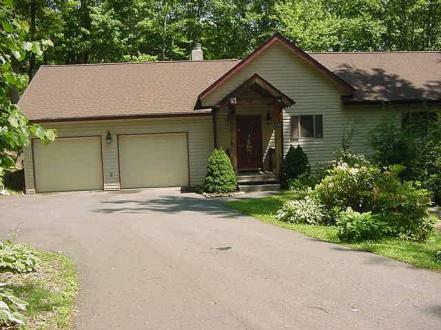 It is within walking distance to the golf course and the ski lodge. Non-smoking, no pets allowed.